Messiniaki Mani or Exo (Outter) Mani begins from the area of the settlement of Kardamili and extends south shortly after to the village of Saint Nicon. Along the coast of the Messinian Gulf are nice coastal settlements, and in the interior, on the slopes of Mount Taygetos, picturesque villages. As everywhere in Mani, in this region of Mani are also remains of ancient cities, castles, monasteries and old churches. 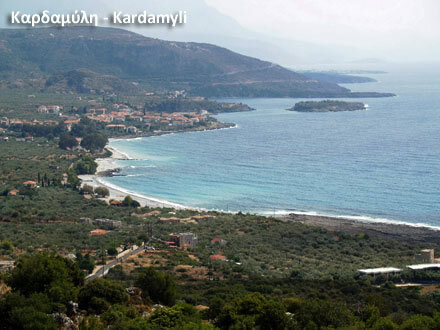 Kardamyli is a typical village of Mani; located on the shore of the Messinian Gulf, 39 km southeast of Kalamata, is the center of a beautiful, well-developed tourist area. There are hotels, apartments and rooms to let, campsites and taverns known for the good food. We can swim at the beach of the town and other beaches at a short distance. At half a kilometer north is Ritsia and just north of it the beach Chalikia. South at half a kilometer is Salio, in one and a half kilometer Kalamitsi, in two and a half kilometers Phoneas and shortly after Neo Proastio. 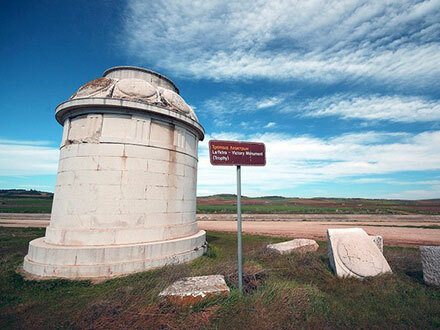 Kardamyli is located at the site of the ancient Kardamyli, which is mentioned by Homer as one of the seven cities offered as dowry by Agamemnon to Achilles to marry his daughter. Later was a city of nearby residents of Sparta. During the Roman era, at the time of Augustus, was a main port of Sparta, connected with the royal road that crossed Mount Taygetos. Then it became a member of the League founded by the free Laconian cities. On a nearby hill are the remains of the Homeric citadel. Just outside the town are the tombs of Dioskuri carved in rock. In the Upper Kardamili is preserved the Tower of Mourtzinou, in a typical Mani fortified complex. Near is the Byzantine church of Aghios Spyridon; its belfry is like a tower, decorated with reliefs. In the village Petrovouni, 2 km east, is the monastery of Faneromeni. In the islet Merope, 300 m from the shore of Kardamyli, are ruins of Venetian walls; also the chapel of Aghios Ioannis. East of the beach of Neo Proastio (Suburb), to the interior is the village Proastio, where the church of the Assumption, built in 1790. Nice are the tours with many attractions in northwest and northeast of Kardamyli on the slopes of Mount Taygetos. Northwest to 12 km is the picturesque village of Cambos, where stands the Byzantine church of Saints Theodori. Nearby, at the site Garbelia, is the tower of Koumoundouros, historic family. Alexander Koumoundouros (1817 - 1883) was one of the political personalities of Greece during the 19th century and Prime Minister repeatedly. Near Cambos, on top of a steep rocky hill, is the castle of Zarnata, a strategic point since the Byzantine era. During the Turkish rule was strengthened with additional walls. After the Turks and the Venetians, was in the hands of captains of Mani. Two kilometers west of Kambos is the village Stavropigio with stone houses, towers and churches. Southeast, near the village Prossilio, is the Byzantine monastery of Panagia Androumbevitsas, built in the 12th century. It has been renovated and has architectural elements of Mani. Northeast of Kardamyli, where there are many villages close to each other, the Gorge of Vyros is formed. Its length is 20 km. After two and a half hours of hiking we reach the sources of the river Vyros. Near are old mills. South not far from Kardamyli the main road leads along the coast to the region of Stoupa with beautiful sandy beaches. Stoupa, a coastal settlement 45 km from Kalamata, is one of the most famous tourist destinations of Messinia with large residential and tourist development. There are hotels, apartments and rooms to let and taverns. 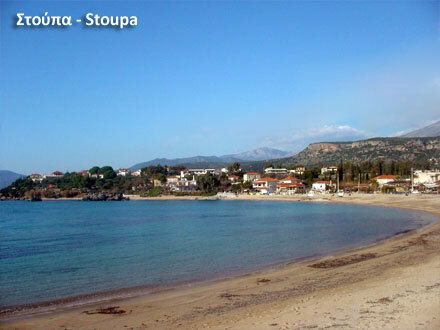 We can enjoy the sea at the beach of Stoupa and a little further north in Kalogria Beach, where is a camping site. Near Stoupa is the mine of Prestova where, it is said, the great Greek author Nikos Kazantzakis met Alexis Zorba. From Stoupa a road leads inwards at two kilometers to the village Lefktro, where the Byzantine church of Ypapantis (the Visitation) with beautiful paintings. On the hill are the ruins of the Frankish castle of Gisterna or Beaufort, built in 1250 on the position of the acropolis of the ancient city Leuctra, which was a little further south. Another road leads from Stoupa to villages in Mount Taygetos. 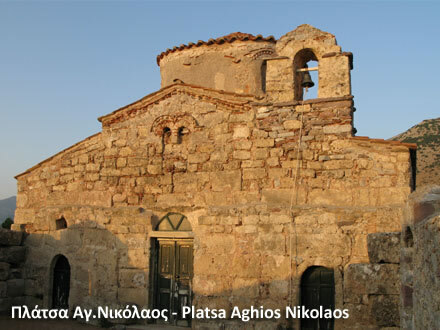 In Kastania are old houses, Byzantine churches and the tower of Dourakis, captain of Mani. From Stoupa the road along the coast leads to four kilometers in Aghios Nikolaos, a picturesque fishing village, where we reach taking a short road to the sea. There are rooms to let and a beach. The harbor is good shelter for small boats. From Aghios Nikolaos, the main road turns inward continuing southward, while a coastal road linking the seaside villages. On the coastal road after two kilometers is Aghios Dimitrios at the cove of a small bay, with rooms to let and a beach. At a short distance, on the main road is the village Platsa; a typical settlement of Mani with olive trees and springs. From Byzantine churches St. Nicholas stands with beautiful paintings. In the area is the tower of Christeas, captain of Mani. At the coast, one kilometer south of Aghios Dimitrios, there are impressive rock formations and about two kilometers further is the cave Katafyngi. Following is the beach of the village Nomitsi, which is located higher in the main street. Nearby is the village Thalames, built on the site of the ancient city of the same name, where it was the dream-oracle of Ino. Adjacent to the main fountain are pedestals with dedicatory inscriptions from Roman times. In a tower dwelling is housed an historic and folklore museum. After Thalames in the main road is the village Langada with old churches. A small road from Thalames leads to the coast on a small peninsula, where is Trachila, picturesque fishing village with a tower. Towards the end of the peninsula is a cave. In Trachila we reach also following the coastal road. From here a smaller road follows the coast and reaches the coastal village Chotassia, located in Laconia. The last settlement of Messiniaki Mani in the south is Aghios Nicon in the main road.